Submitted by Jeff Buster on Tue, 09/08/2009 - 13:12. There are thousands of structures like this in NEO. We don't even notice them anymore. This one has a nice slate roof, and oh, did I mention the wrap around porch?. Here come's my bus, got to go....to a sustainability lecture...I think the topic is embedded, ah, emedded apathy? no, that's not right.. . Submitted by Eternity on Tue, 09/08/2009 - 20:19. I look at homes like the one in the picture and I just don't understand it. A beautiful home like that, clearly of historical value (built circa 1925 or so?) with a raised--covered porch, a fireplace(s) and the overall size is in excess of 3000 sq ft, a basement, lots of windows and a level lawn, would be a hot commodity here in Atlanta, regardless of condition or neighborhood. In your post you allude (jokingly) to the embedded apathy in the region. It must be that. It has to be that (apathy) because if people were using their logic and reason, instead of pure emotion, they would realize that they are sitting on a f*cking goldmine. NEO needs to snap out of it...get off the pity pot already; in order to realize and embrace the power at hand, to and sieze the moment--the year--the decade. This is not idle rhetoric, this is the real reality. All major cities share one thing in common, if nothing else, political greed and corporate croynism. That's a given. But even if you look at a place like Oakland, California, which is legendary for it's crime, you still never see this type of neglect of the local real estate. I've lived both on the East Bay and in Downtown Sanfrancisco, so I'm speaking from first hand experience on this. And even when Atlanta was, in the 1970's, the murder capital of the world, we certainly had poor neighborhoods (still do) yett a certain degree of pride still remainded. We knew our worth. It's as if Cleveland has forgotten it's a world class city? Of all that I've heard about since getting to know a few folks in NEO, the thing that keeps coming back to me is that fact that there does not exist a Cleveland (NEO) Development Authority, who's sole purpose is to repurpose neglected and abandoned buildings, while also transforming (for the better) the social fabric of the neighborhoods by providing robust incentives for reinvestment. This is a total no-brainer, and without some sort of institutional mechanism like a development authority fully engaged, I just don't see how NEO will get itself together. Cities must fight crime and create jobs, that's a given. Hence that is exactly why Development Authorities are so effective, because when a person is working a job, making a change for the better, crime is not so much on their mind. And as more people work to rebuild, more people contribute to the tax base, which provides more money to invest in civil services. Clevelands got a bunch of damn lemons; you guys all seem to agree on that. So I say, start making some lemonaide...the best damn lemonaide this nation's ever tasted, smelled or seen. I talk the talk, but I also walk the walk, so don't you think for a minute that this comment is some kind of fuffy-assed pep chat. A solution driven agenda, with a result oriendted focus, that is where the action's at. It doesn't take a genius, and I'll give you just one example why. About 7 years ago a student at Georgia Tech came up with this crazy idea to transform all the old abandoned rail lines that circle Atlanta into a new "Beltline" of business, housing and recreation. It would be a project to elevate the local--regional economy. But he didn't just talk about it, he actually got together with some of his friends, colleagues and teachers and put together a real-life masterplan, which he presented as he thesis for graduation. One of his teachers was so impressed with the idea that they showed it to some movers and shakers, then the document wound up on the Mayor's desk. Long story short, the plan got adopted as formal legislation by The City of Atlanta, and it has since spurred a multi-billion dollar investment project that has people from all walks of life coming together for a common goal. Cleveland might lack self-esteem, but Cleveland (NEO) is not beyond repair...not by a longshot! he may have meant "embodied"
Submitted by Susan Miller on Tue, 09/08/2009 - 19:41. There is certainly a good amount of embedded apathy here, Max. But the purported sustainability lecture (and let me assure you, few take the bus to them) might have been on embodied energy. You know, the greenest building is the one that already exists - that lecture - the one AIA Cleveland, nor Cleveland Restoration Society (our NTHP affiliate), nor our Green Building Coalition have sponsored. Our city is rife with these beautiful structures (those that have yet to be razed). Who without a job or an income of any kind can afford them? I hear that work began (perhaps) on the house next door to mine. It was foreclosed and sat empty for years except for one renter for 6 months who left when the landlord in foreclosure stopped paying the gas bill. The house - a brick bungalow in good repair just sold to an investor for $20,000. The gorgeous home behind me in a great inner ring suburb with a solid school district that should sell for upwards of $150,000 caught a $50,000 price at auction (it's totally and beautifully renovated - empty for four years). In my inner ring suburb, police response time is under five minutes. The neighborhoods are walkable and culture abounds. But where I live we have point of sale inspections. If it's broken, it cannot be sold without part of the exchange being to fix it. In Cleveland and East Cleveland there is no such legislation, so homes fall into disrepair and are passed along that way until someone defaults big time and then water, thieves, wind and vermin take the reins. Those white collars Jeff may refer to don't live in Cleveland - not that Cleveland/East Cleveland. OK, one I know does live in Cleveland/Shaker Heights. Some folks are moving back, but if you sprinkle in some artists and the neighborhood shows any signs of return, watch out - here comes the Strategic Investment Initiative to erase any semblance of what made the neighborhood a neighborhood in the first place - oh, yes and to add franchise drugmarts and fast food economic development. I'm not sayin' it's impossible, just tough. And I think that Jeff is referring to the vision thing - you know, we have vision, but not sight. If we could begin to see what we already have and begin there instead of starting over again and again, we might move ahead. But you know as well as I do that everyone (especially foundation givers) likes a bright new shiny thing. So like the Carnegie Medical Building, we'll probably see this one headed to a landfill soon. Check out what Norm did with his house in East Cleveland to get a glimpse of the former and potential grandeur here in a city that once was one of the richest in the country. It takes cash and tenacity. Not all of us have that these days. Submitted by Eternity on Tue, 09/08/2009 - 21:43. I am bigger than my government, in the way that I perceive my power--in the way that I walk these streets. It wouldn't matter where I lived. Some years ago I had a good friend, who was part adopted father, part chum, part guru. He'd dead now from pancreatic cancer; as the sweetness of his life went away. It really came as no surprise when I heard that my mentor-friend had perished from the toxcity of cancer on sugar processor; his pancreas. Aor sure, it's sad. But while he was alive, the man was a huge inspiration to me and so many others. One of the things he used to say to me was "the gift of giving is in the giving." It took me some time to understand what he meant, which was to say something like the joy of living is in the joy of discovering one has life. It's a paradigm shift in thinking that seems paradoxical at first glance, but in the end holds much power and wisdom. It's that whole being in the right place at the right time thing, which also echos that when the student is ready the teacher will come thing. And that reminds me of a lecture I heard in 2001 that was given by the Dalai Lama, The topic of Tezin's topic was "Finding Peace through Inner Peace." In this, His Holiness then spoke eloborately (and eloquently) about the world peace, which not surprisingly comes (in his opinion) from a collective inner peace. I have to agree. Never in my life have I sat with such a serene group of people. The crowd from the Dalai Lama's talk was in the thousands, but would you believe that after it was over when everybody was trying to exit the parking lot, not one horn was honked. There was a sort of stillness that had come over us all...a collective meditation that we were not even cognitive of. Interesting, but what does that have to do with the title of this comment "It takes a vision fo have vision." What does one see on the outer experience of Cleveland's physicality versus what one see's within the internal engagement with Cleveland? Are these "visions" in sync? Is this something yet to be fully expored in NEO...vision? Nevermind the do-nothing politicians and the naysayer nitwits, what about the individual with a dream? "We create what we believe." That doesn't come from someone famous, that's just something I articulate and affirm through the self-evidence that has become abundantly apparent in my own life. Right thinking leads to right action, that's what the Buddhist say. Submitted by Jeff Buster on Tue, 09/08/2009 - 22:00. Thanks for your words of encouragement. I trust we are directing our energy towards a practical end. Submitted by Charles Frost on Tue, 09/08/2009 - 20:16. My regular commute takes me to the intersection of 75th and Union. at that corner I turn left. I drive up an incline to what used to be an industrial grade railroad crossing, that now is sporting bicycle crossing signs, as it has become one of the many "rails to trails" conversions that have become so welcome to the bicycling population. Once down from the bike path crossing I find a small neighborhood where there seems to be a front porch re-construction fairy at work. Not one, two, three, but four or more houses there in the single block before Aetna Road there are new porches. 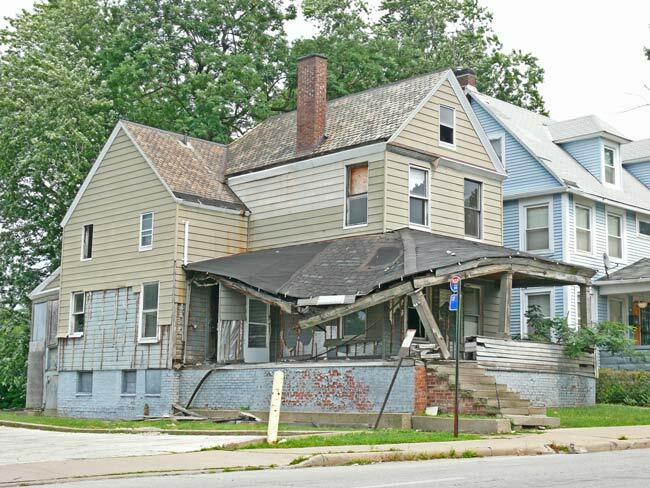 The houses have been fixed up too, and it is enough to give one hope that true entrepreneurism isn't lost in Cleveland, Ohio. It seems to me (the Pollyanna) that that true entrepreneurism it is just hiding in little nooks, crannys, and backwaters in our fair city, far from the light and cameras of those who would sensationalize the economic downturn for their own gain, such as the Plain Squealer. I always find the "good" news more enjoyable than the "bad". Submitted by Eternity on Tue, 09/08/2009 - 21:45. I love your spirit and enthusiasm. Great vision! Cleveland is a wonderful place. I can't wait to visit!